Forearm implants are used to create an increase in muscle mass and definition in the lower arm. This is an excellent option for those with large upper arms but have trouble increasing muscle mass to this. 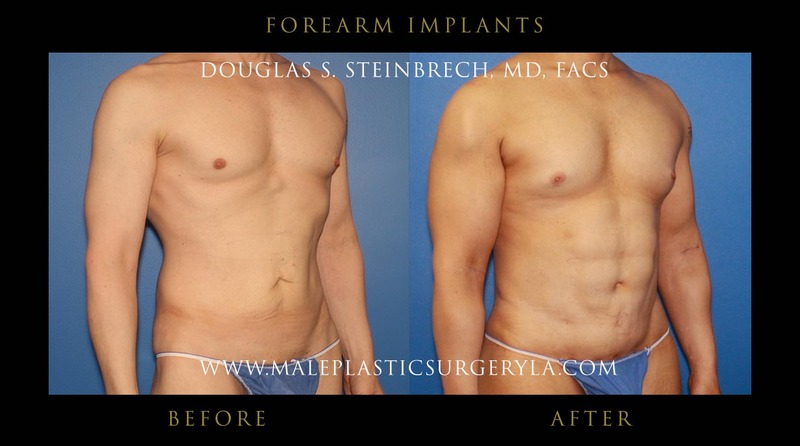 Dr. Douglas Steinbrech specializes in forearm implants for male patients in NYC. Implants are tailored to each individual to ensure a balanced, seamless look. Sometimes, even with vigorous exercise, people are not able to shape and tone their forearms to their satisfaction. Forearm implants help such people achieve the appearance of larger, more defined muscles in their arms. 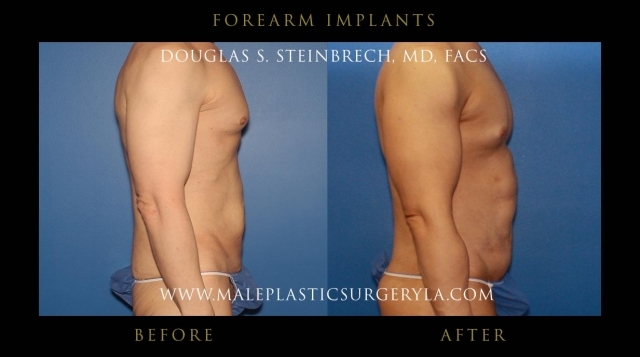 Forearm implants can improve the proportion and appearance not only of the lower arm and wrist but of the entire body. Incisions are hidden in the inner crease in the crook of the arm (antecubital fossa) to conceal scaring. Male patients in Los Angeles will typically see a change immediately after their forearm surgery is complete. Increased sense of self-confidence after surgery, and many feel comfortable rolling up their sleeves. Forearm implants can create muscular definition and increased mass/fullness in the lower arm area. This procedure is specifically useful for those men and women who, even after extensive muscular conditioning, can’t achieve the lower arm toning that they desire. Forearm implants are also recommended for those unique instances when an injury has occurred and muscle mass augmentation is needed to achieve normal balance. During the forearm implant procedure, an incision is made, and a soft, solid silicone implant is fashioned to specifically fit each patient and inserted into the pocket. A pocket is then created large enough to hold the forearm implant. The forearm implants are then inserted through the incision and precisely positioned within the soft tissue. This area, consisting of muscle and fat, will form healing tissue that will help keep the implant in place. The incision is closed with sutures, and a bandage is applied to reduce swelling and discomfort. The very small dressing is placed and the patient can typically see the change immediately after surgery. Recovery after forearm implant surgery may take up to four weeks. Moving your forearms may be difficult for the first week. Surgical risks for forearm implants may include: infection, bleeding, asymmetry, scarring, and muscle and/or nerve damage.